Sometimes I get obsessed. I get obsessed with people, with food, with places. And also with colours – as it was the case of an almost entire month, when everything that I cooked was green: asparagus, peas, spring onions, beans, green peppers, celery, parsley, mint, you name it. My whole life was green. Or so it looked, anyway. Or maybe it was just me, invoking the spring, hoping that if I’ll turn my life green, it will will come earlier. Well, the spring is indeed here, albeit we could always use a bit more of that lovely sunshine. This time is red. And strawberries. Well, to be perfectly honest, with red is an entire different story. My camera is red. My diary is red. The phone on my desk is red. I’ve got red pans, red trays, red carpet, and yes – red bag. I know, it’s weird. By the way, does anyone knows why don’t they make red iPhones? Anyway, back to (red!) strawberries. If on the other day it was all about the sophistication and complexity of taste, pairing strawberries with strong Gorgonzola cheese and bold balsamic glaze, this time is about simplicity. The joy and pure satisfaction of a simple flavour. And the strong memories that this flavour is carrying with it. It is about sweet childhood memories, when strawberries were only available in season and having the first strawberries of the year was a moment of pure celebration. My mother used to top them with sugar and leave them in the refrigerator to marinate for a while. Simple as that. I can still remember the smell of fresh, perfumed strawberries bought from the farmer’s market straight from the local producers. Back then, buying from local producers was indeed the only option. We didn’t had supermarkets. It’s funny how times are changing. Now we can have strawberries at any time of the year. Still, buying them in the middle of winter is merely a waste of time, as they usually are tasteless. 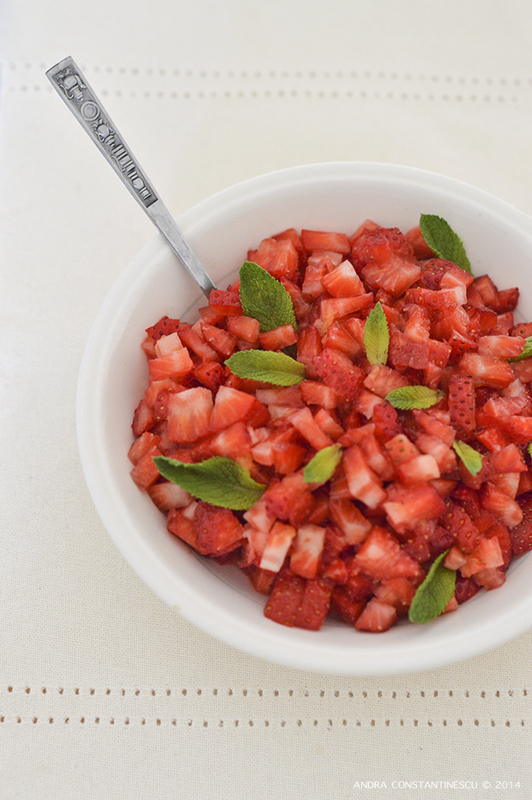 So, a simple strawberry salad I have for you today, my tribute to British strawberries coming in season at this very moment. There’s just a handful of ingredients involved: a touch of sugar, just as in back in the old times, to help them bring out their natural sweetness, a simple orange and lemon juice dressing and fresh mint to garnish. Oh, and one hour of pure relaxation while waiting for the salad to get its perfect balance of sweetness and acidity. Place the strawberries in a bowl, top with sugar, orange and lemon juice. Mix well. Cover with cling film and leave to marinate in the fridge for one hour. Serve cold, garnished with fresh mint leaves. 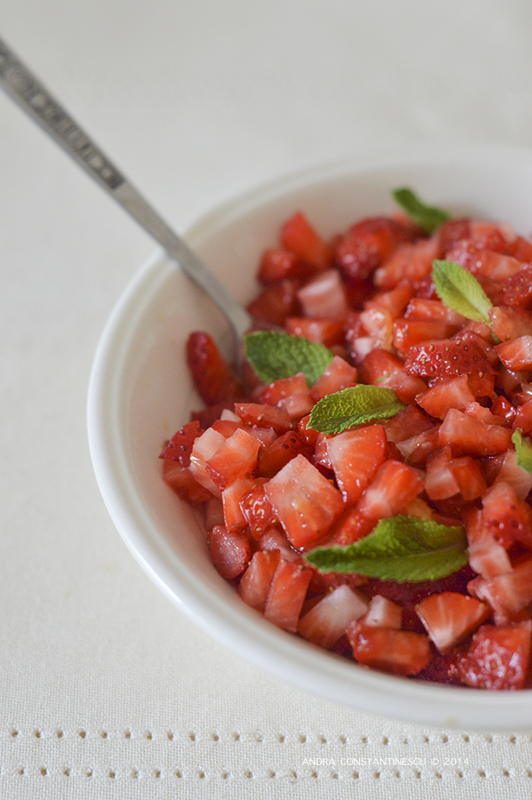 I think fresh mint goes so well with strawberries. It’s a beautiful salad.